I made this card at the same time that I made the Flourishing Phrases Emboss Resist card. I don't know what this technique is called - I suppose it's a variant of the Black Magic technique. Start out by wiping a piece of black cardstock with an Embossing Buddy then stamp the image with Versamark, sprinkle with white embossing powder and use the Heat Tool. Then colour along the white lines with Stampin' Blends alcohol markers - I used Dark Bermuda Bay, Dark Flirty Flamingo and Light Real Red. 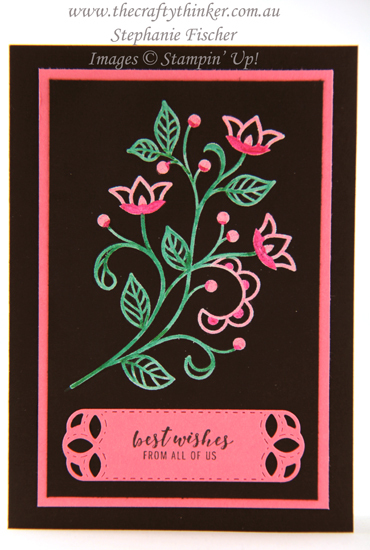 The greeting is from the Itty Bitty Greetings stamp set and that Flirty Flamingo label is cut with one of the Stitched Labels dies.